Bombus lucorum, the white-tailed bumblebee, is one of the more common of our native UK bumblebees. It is also one of the first to emerge from hibernation in the Spring. 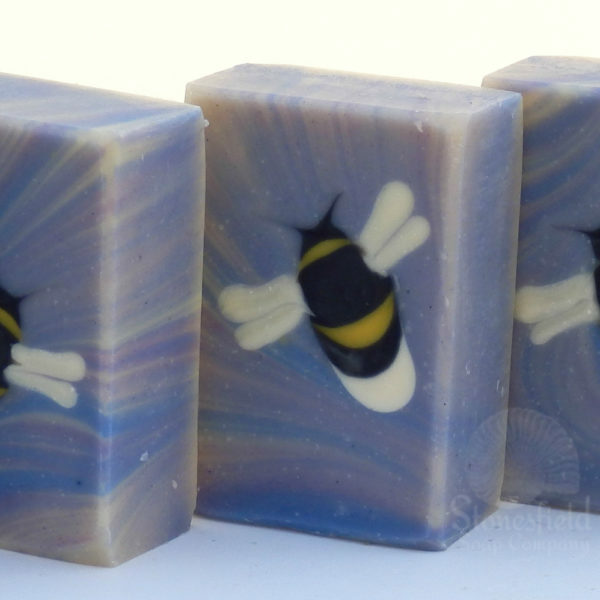 ‘Bumblebee Lucorum’ is scented with an essential oil blend that includes lashings of lavender supported by cedarwood and mandarin, and a lilac/purple swirl beneath the bees to represent fields of lavender. With local cold-pressed rapeseed oil, olive oil and sunflower oil, shea and cocoa butters and creamy coconut milk (which means that Bumblebee Lucorum is now vegan-friendly). 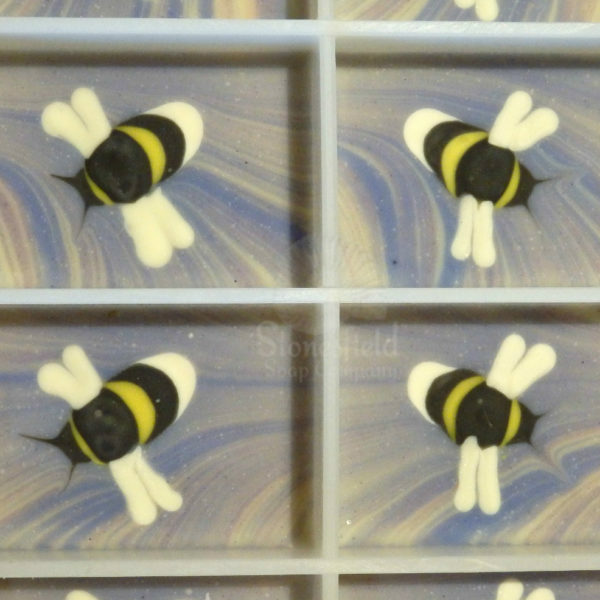 20% of the sale price of each bar will go directly to the Bumblebee Conservation Trust. Our supplier for mica has assured us that it is not mined using child labour. Please note: as this is a handmade product there will be variations between individual bars; the product images displayed are only examples of the design although the overall theme will be the same. Generally speaking, no two bars are exactly the same and may have slightly different dimensions owing to their hand-cut nature. Additionally, some bars may bear a whitish ‘bloom’. 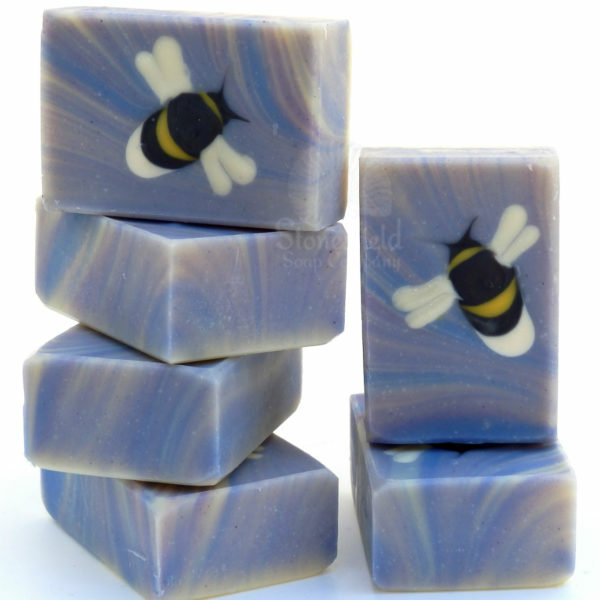 This is perfectly harmless soda ash which occurs commonly on soaps with a high percentage of lavender essential oil that need to be poured when the batter is very fluid (as is the case with Bumblebee Lucorum); it will disappear within the first few uses of the bar. 'Ale & Arty' - I pinched some of my husband's 'Old Hooky' beer for this one (he was wondering why the bottle seemed to empty so quickly). 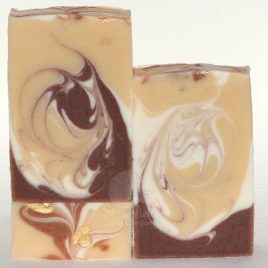 Enriched with shea and cocoa butters as well as delicious carrot tissue oil for natural colouring and skin conditioning. 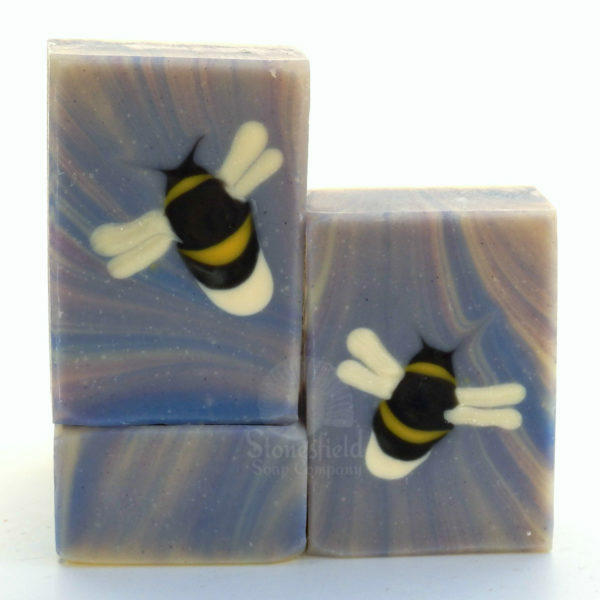 Coconut milk, kaolin clay and honey are also added for the gentle properties they bring. With the men in mind, this is fragranced with an essential oil blend that includes bergamot, ho wood, geranium, patchouli and grapefruit, but don't be surprised if the ladies want to use it too. There are two options for packaging. Please choose from: Basic packaging: The soap bar has a cigar band label with full ingredient details and is packed in a compostable glassine bag Gift box packaging: The soap bar is wrapped in a translucent vellum sleeve with a handmade paper band and tied with a fine satin ribbon. It nestles in fine ivory shredded paper in our bespoke ivory ribbon-pull matchbox-style gift box. Except for the ribbon, all packaging is recyclable. Price is for one bar, 95g approx / naked bar. Packaged product weights (NB these weights are an approximation only) Basic packaging - 95g approx Gift box packaging - 120g approx. Please note: as this is a handmade product there will be slight variations between individual bars and different batches; generally speaking, no two bars are exactly the same. The product image displayed is only an example of the design. 'Quantum' - one for the men (but equally good for women!) - with cocoa and shea butters, hemp seed and sunflower oils, tussah silk, buttermilk, bentonite clay and activated charcoal. Fragranced with a rather lovely masculine blend of essential oils that include bergamot, orange, bay, geranium, cypress, vetiver and patchouli. 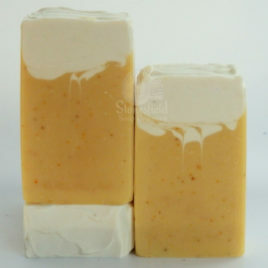 This is a gentle goatmilk and silk soap packed with skin-loving avocado oil, sunflower oil, carrot tissue oil and raw shea butter. 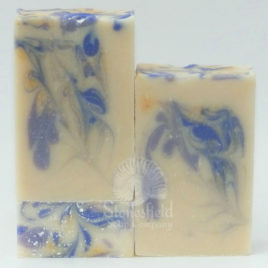 Its essential oil blend gives it a beautiful woodsy warm lavender aroma with a fruity citrus note. There are two options for packaging. Please choose from: Basic packaging: The soap bar has a cigar band label with full ingredient details and is packed in a compostable glassine bag Gift box packaging: The soap bar is wrapped in a translucent vellum sleeve with a handmade paper band and tied with a fine satin ribbon. It nestles in fine ivory shredded paper in our bespoke ivory ribbon-pull matchbox-style gift box. Except for the ribbon, all packaging is recyclable. Price is for one bar, 95g approx / naked bar. Packaged product weights (NB these weights are an approximation only) Basic packaging - 95g approx Gift box packaging - 120g approx. Please note: as this is a handmade product there will be slight variations between individual bars and different batches; generally speaking, no two bars are exactly the same. The product image displayed is only an example of the design. 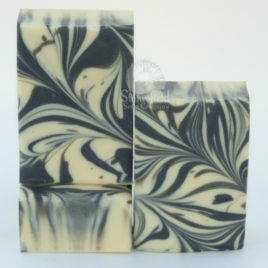 This has a deep, smooth aroma that includes vetiver, grapefruit, frankincense and geranium essential oils as well as a subtle undertone courtesy of the organic cocoa powder that gives the soap its soft brown contrast. Organic coconut milk adds a delicious creaminess with shea and cocoa butters, olive oil and rice bran oils conditioning the skin. There is a choice of packaging. Please choose from: Basic packaging: The soap bar has a paper cigar band label with full ingredient details and is packed in a compostable glassine bag Gift box packaging: The soap bar is wrapped in a translucent vellum sleeve with a handmade paper band and tied with a fine satin ribbon. It nestles in fine ivory shredded paper in our bespoke ivory ribbon-pull matchbox-style gift box. Except for the ribbon, all packaging is recyclable.